When looking for gifts for wolf fans, you come across a wide array of products up for grabs, which makes it quite a daunting task. But, if you were given some advice on the topic, it would be far easier to make the right choice, isn't it? Well, not to worry, as we have you covered! Just blaze through this guide, as we tell you about the best wolf products as gifts for that special someone. If the wolf fan you know loves to show off his affinity towards wolves, then this would just be the right gift for him/her. How so? First things first, the design is quite amazing - no seriously - it's really that good! 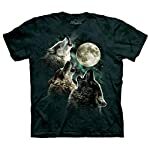 The front of the tee shows three wolves howling at the moon at the same time. This is quite telling of the dominant yet closely congruent nature of the wolves. Also, if your friend is environmentally conscious, then there is a snippet in stock - the tee is environmentally friendly! Furthermore, it has been crafted in the USA, so, you could rest assured of its quality too. This is amongst the best books written with wolves in the focus, period! This books is written from the perspective of Jim and Jamie Dutcher, who have spent countless years studying as well as analyzing the behavior of the wolf pack that they were living with. This wolf book is full of pictures showing an intimate connection between the Dutchers and their wolf pack. It showcases the bonding that the couple has developed with their wolf pack, and how they live through each and every moment together as a team. Also, the pictures are quite telling on the mixed moods that wolves have at different times, and how their actions define their behavior. Coloring books are the new craze, and one filled with wolf images can't be beat! This book is filled with 40 different wolf pictures to color - given on one side of each page. This makes it easier to remove and frame the pictures when you're done coloring. This is the perfect book to tap into the creative conscious and can make a great gift for yound children and adults. The creations inside the book have been handcrafted by various artists of repute, and it's very hard to find any fault with them. In addition to that, the book is known to create lasting memories. If you are looking for a great keepsake gift, look no further. 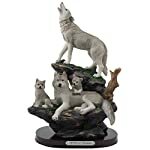 This beautiful wolf figurine is magnificent to look at and will surely be appreciated. It envisages the usage of best materials to keep it long lasting and never compromises on the quality. This is a great gift for a family member or a friend who refers to their family as a pack of wolves. This gift is bound to leave a lasting impression on the grantee; as they would have something to remember you for! The above are some of our favorite wolf gifts that are affordable, durable and will be utilized and appreciated.